By default the temporary D: drive hosts the Windows page file, so we will have to relocate that before we can change the drive letter. We have to find out what the Azure provisioning process will do when it finds a data disk is already using the D: drive letter. By default there is also a DVD drive mounted as E: that we will have to get out of our way. In order to automate the procedure of setting up a virtual machine with a persistent D: drive we are going to use PowerShell. You can download the cmdlets for Windows Azure here. You could also use the Windows Azure Portal and configure the VM within a RDP session. 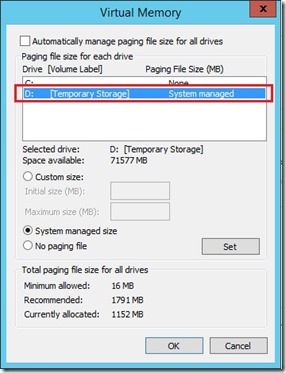 By default a Windows VM in Azure has configured a single page file on the scratch disk (‘Temporary Storage’) D:. Before we can change the drive letter of the temporary disk we need to move the page file to the OS drive C: and reboot the VM. We can do that via Remote PowerShell from our local machine. Michael Washam provides a good explanation about Remote PowerShell and Windows Azure on his blog. What this script also does is disabling the DVD drive by changing its corresponding registry value (set ‘Start’ to ‘4’). By default the DVD drive is mounted as E: initially, but might actually vanish after a VM is shutdown (de-provisioned) and re-started. This means that if we took F: for the scratch disk initially, it would move down to E: in case the DVD drive is going away. Reason for this is that the fabric obviously mounts the temporary drive as the next ‘available’ drive letter. In this case the updated page file configuration (pointing to F:) would be screwed, resulting in an error and creation of a temporary page file, which we have to avoid. Anyway, we can obviously fix this by disabling the DVD altogether and thus get a stable setup. $drive = Get-WmiObject -Class win32_volume -Filter "DriveLetter = 'd:'"
Actually we could add more than one disk to the VM and push the temporary disk further back in terms of its drive letter. Just be aware that you have to use the next available letter for the scratch disk without any gaps. Finally we need to move the page file back to where it belongs, which is to the scratch disk. Again, changing the page file configuration requires a reboot. The approach described in this post seems to work fine as long as you ‘comply’ with the Windows Azure provisioning process for VMs. The provisioning engine will take the first available drive letter and use it for the scratch disk, starting with D:. If you consider that you can attach as many disks as the VM size allows. 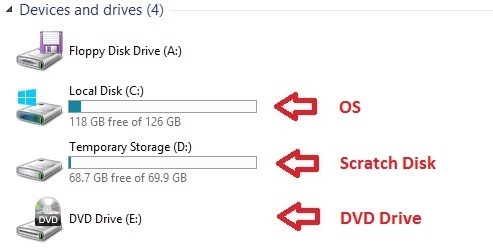 You just have to make sure to use the corresponding drive letter for the scratch disk. Shutdown the VM (so it gets into stopped/de-allocated state, which means de-provisioned) and restart it again. 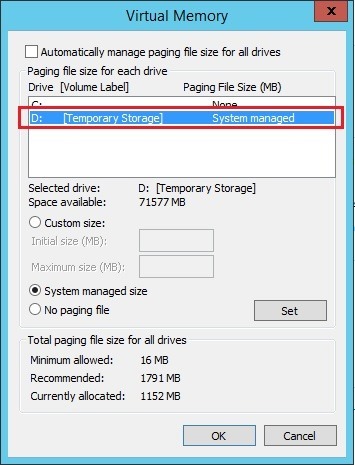 Changed the VM size to a smaller or larger configuration. Bluescreened the machine (using Sysinternals NotMyFault utility). 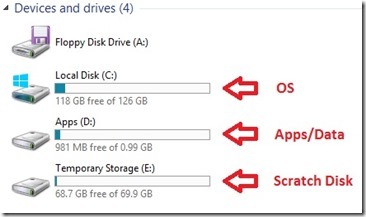 In all cases above your VM will get re-deployed with its specific disk configuration, the scratch disk will be wiped, and your machine will potentially be brought up on a different Hyper-V host. I tested the scenario with Windows images from the Gallery and attached empty data disks. Using VHDs that have been uploaded from on-premises and also attaching existing disks containing data shouldn’t be any problem. You would just have to tweak the PowerShell cmdlets a bit. Warning: the method described in this post works fine today with the current provisioning architecture of the Windows Azure fabric. This might change in the future. This entry was posted in Microsoft Azure and tagged Azure, Data Disks, IaaS, Microsoft Azure, Migration. Will this work even in service healing scenario in Azure ? Is it possible to do this via an arm template? or via DSC? We have recently updated Azure VMs so the temp drive letter will be maintained regardless of which drive letter is used. So you can set the temp drive letter to something like T: or Z:, and it will be maintained through stop/start operations or Azure healing operations which used to cause the drive letter to reset back to the first available drive letter. This change applies to both Classic and ARM virtual machines. Drew, is there official documentation for this somewhere?